Starch makes up the nutritive reserves of many plants. During the growing season, the green leaves collect energy from the sun. 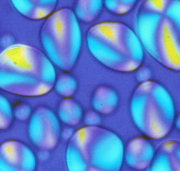 This energy is transported as a sugar solution to the starch storage cells, and the sugar is converted to starch in the form of tiny granules occupying most of the cell interior. The conversion of sugar to starch takes place by means of enzymes. Then, the following spring, enzymes are also responsible for the re-conversion of starch to sugar - released from the seed as energy for the growing plant. Corn, Zea Mays, is grown in most countries throughout the world. It requires, however, warmer climates than found in the temperate zones to grow to maturity. DENT corn, the scientific name of which is Zea Mays Indentata, is also called "field" corn. It is a corn variety with kernels that contain both hard and soft starch and become indented at maturity. It is a major crop used to make food, animal feed, and industrial products. This is the variety to be considered for cornstarch manufacturing. FLINT corn, known by the scientific name Zea Mays indurata, is a variety of corn having hard, horny, rounded, or short and flat kernels with the soft and starchy endosperm completely enclosed by a hard outer layer. It is similar to dent and is used for the same purposes. Most of it is grown in South America. WAXY corn is a corn variety with grains that have a waxy appearance when cut, and that contains only branched-chain starch. It is grown to make special starches for thickening foods. SWEET or "green" corn is eaten fresh, canned, or frozen. It is a type of corn that is grown in many horticultural varieties. 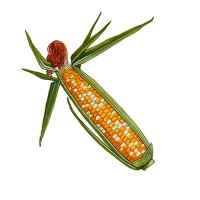 It is occasionally considered a distinct species (Zea saccharata or Zea rugosa), a subspecies (Zea Mays rugosa), or a specific mutation of dent corn. It is distinguished by kernels containing a high percentage of sugar in the milk stage when they are suitable for table use. FLOUR corn, also called "soft" corn or "squaw" corn, has kernels shaped like those of flint corn and is composed almost entirely of soft starch. It is known by the scientific name Zea Mays amylacea. The USA grows small amounts of blue flour corn to make tortillas, chips, and baked goods. In South America this corn is grown in various colours to make food and beer. The raw material for wet milling is shelled dent corn delivered in bulk. The corn is inspected and cob, dust, chaff and foreign material are removed. The cleaning is normally done twice before wet processing. After cleaning the corn is transported to the steeps. 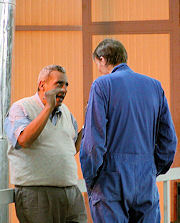 International Starch has a process for the extraction and refining of starch even from corn flour or mill by-products. A proper steeping is essential for high yields and high starch quality. The steeping is carried out in a continuous counter-current process. The cleaned corn is filled into a battery of large steeping tanks (steeps), where the corn is soaked in hot water 30 to 48 hours to begin breaking the starch and protein bonds . The gluten bonds within the corn begin to loosen and release the starch. The steeping is actually a controlled fermentation. Sulphur dioxide improves the fermentation by enhancing growth of favourable micro-organisms, preferably lactobacillus, while suppressing detrimental bacteria, moulds, fungi and yeast. Solubles are extracted and the kernel softens. The kernel swells to more than double size and increases its moisture content from about 15% to 45%. The steepwater containing approximately 10% dry substance is drained from the kernels and condensed on a multi-stage evaporator. Most organic acids formed during the fermentation are volatile and evaporate with the water. The condensate from the first evaporator stage will therefore be discharged after the heat is recovered by preheating the entering steepwater. The steepwater is condensed to an auto-sterile product - a valuable nutrient in the fermentation industry - or concentrated to approximate 48% dry matter and mixed and dried with the fibre fraction. SO2 The sulphur dioxide may be prepared by burning sulphur and absorbing the gas in water. Because modern processes call for more strict and narrow dosage, a supply of sulphur dioxide gas under pressure is preferred or SO2 is replaced by sodium hydrogen bisulphite where no local gas supply is available. The soften kernels are broken up in attrition mills to loosen the hull and break the bonds between germ and endosperm. Water is added to assist the wet milling. A good steeping ensures that the germ will be freely released intact from the kernel by a gentle milling operation with no free oil. Oil constitutes half the weight of the germ at this stage, and the germ is easy to separate by centrifugal force. The lightweight germs are separated from the ground slurry by hydrocyclones in a two step separation with regrinding in between. The germs are washed repeatedly counter-currently on a three-stage screen to remove starch. Process wash water is added at the last stage. Surface water is removed from the germs by a tapered screw press. The dewatered and clean germs are fed to a rotary steam tube bundle dryer and dried to approximate 4% moisture. Low moisture content improves shelf life. The germs are cooled and pneumatically transported to a germ silo ready for bagging or oil extraction. Mechanical presses and/or solvent extraction are used to extract the crude oil from the germ. The crude oil is refined and filtered. A typical yield per ton corn is 27 kg corn oil. During refining free fatty acids and phospholipids are removed. The finished corn oil finds uses as food and cooking oil or as raw material for margarine. Refined corn oil has a pleasant taste and does not develop off-flavours in cooking and frying. The high content of polyunsaturated fats is a nutritional advantage. The residual extracted corn germ meal is used in animal feeds or combined with the gluten feed. After germ separation the mill flow is finely ground in impact or attrition mills to release starch and gluten from the endosperm cell walls (fibres). The degerminated mill starch leaving the fine mill is pumped to the first stage of a fibre washing system, where starch and gluten is screened off. The overs, hull and larger fibres, are washed free from adhering starch and gluten (insoluble protein) on screens in counter-current with process wash water added at the last stage. The last fibre washing stage has a slightly courser screen for pre-dewatering the fibre prior to a tapered screw press. The dewatered fibres from the dewatering press may be mixed with concentrated steepwater and cakes from the oil press and dried to approximate 12% moisture. The dried fibre are pelletized to reduce bulkiness and pneumatically transported to a silo ready for shipping. The fibre fraction is a valuable constituent of animal feeds. Starch Underflow A mill stream thickener may be applied on the separator feed. Multi-Stage Hydrocyclone Unit. The underflow, which is mainly protein and a small amount of starch, is discharged to the gluten dewatering section. The dewatered gluten is dried in a rotary steam tube bundle dryer to approximately 10% moisture and disintegrated in a hammer mill. 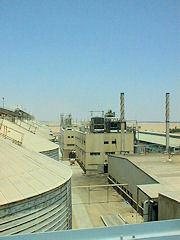 Drying is facilitated by powder recycling. The dried gluten is sold as corn gluten meal with 60% protein. It is a valuable source of methionine. The high xanthophyll content - typically 500 ppm - makes it an efficient pigmenting ingredient in poultry feeds. In the strong gravitational fields of a hydrocyclones and a centrifuge, the starch settles quickly. Refining is based on the differences in weight density between water, fibres and starch: Although some impurities go with the starch in the underflow, there is - by means of a sieve - a last chance to remove the larger particles. Impurities not removed this way are not removable by any known technique. The centrifuge obtains its gravitational force by spinning the bowl. The hydrocyclone has no moving parts and the separation is totally dependent on the pressure difference over the cyclone. The technological development and quality demands have forced centrifuges to give way for hydrocyclones in corn starch refining, but centrifuges still hold a defensive position in gluten concentration. Starch is among the most pure of all agricultural products. Actually, purity is the most important parameter in being competitive. The purified starch milk is discharged to a peeler centrifuge for dewatering. The peeler filtrate is recycled to starch refining. The dewatered starch is batch-wise peeled off and discharged by gravity to the moist starch hopper. From the moist starch hopper the starch is fed by a metering screw conveyor into a flash dryer and dried in hot air. The inlet air temperature is moderate. The dried starch is pneumatically transported to a starch silo ready for screening and bagging. The moisture of cornstarch after drying is normally 12-13 %. Before delivery the starch is screened on a fine sieve in order to remove any scale formed in screw conveyors etc. Most starch is used for industrial purposes. Starch is tailor made to meet the requirements of the end-user giving rise to a range of speciality products. Many and sophisticated techniques are applied. A most versatile principle comprises a three step wet modification: By applying different reaction conditions - temperature, pH, additives - and strict process control speciality products with unique properties are made. These speciality products are named modified starches. They still retain their original granule form and thereby resemble the native (unmodified) starch in appearance, but the modification has introduced improved qualities in the starch when cooked. The paste may have obtained improved clarity, viscosity, film-forming ability etc. Commercial cornstarch is used in the manufacture of sweeteners, sizing of paper and textile and as a food thickener and stabilizer. The by-products are valuable feed ingredients. Being a pure renewable natural polymer, starch has a multitude of applications. Starch finds uses in fast food, sweets, sausages, tablets, and paper, corrugated board etc. and plays a prominent part in our everyday life. In 2004 more than fifty percent of starch was converted to High Fructose Syrups (HFS). Per capita sweetener consumption is now evenly divided between sucrose and HFS. Corn Germ Meal is a by-product from the extraction of oil. It contains typically 20-21% protein and 90% dry matter. Corn Gluten Feed is a mixture of the hulls & fibre fraction with steepwater, corn germ meal and other process residuals. A typical yield per ton corn is 250 kg corn gluten feed with 18-22% protein and 89-90% dry substance. Corn Gluten Meal is the dried gluten from the gluten concentration. A typical yield per ton corn is 50 kg corn gluten meal with 60% protein and 89-90% dry substance. Corn Steep Liquor also known as condensed fermented corn extractives is a high protein ingredient. It is often a constituent of corn gluten feed, but may be sold as is with approximate 23% protein and 50% dry substance for cattle feeds or as a pellet binder.